All products manufactured by Corona Contracts are designed the highest specification. Because our speciality is working as contractors on large projects, we understand that every motorised blind we install needs to fit perfectly and operate with out any issues for many years to come. We aim to save our clients money by creating top quality blinds that will provide trouble free operations. If our clients have any queries about their system, we also provide industry leading aftercare for all of our products, support is only ever a phone call away. Our many years of contracting experience makes Corona Contracts easy to deal with. We understand that construction projects rely on many different contractors working in unison and meeting deadlines in order to avoid costly delays. With Corona Contracts this is not an issue. Corona control design, manufacturing and installation of all products under the control of in house teams. This avoids the risk of delays during the manufacturing phase, whilst our extensive experience with on site installation allows us to always estimate turn around time with a high degree of accuracy. What’s more, we stick to the prices set out in the contracts, the price agreed is the price you will pay. Our installation team are fully versed in the requirements of working in public and private spaces. You can rest assure that your motorised blinds installation from Corona Contracts will be handled with the utmost professionalism. Our punctual installation team will arrive on time and with all of the equipment they need to complete installation of your products on schedule. Before work begins, risk assessments will be carried out and whilst work is in progress appropriate signage will be used. Our team will of course clear up completely after work is completed, leaving the space in the same or better condition as when they found it. Corona Contracts have had the privilege of working in a huge number of different types of building, from large hotels, to churches and religious buildings, through to cinemas and event spaces. Each type of building has its own challenges when it come to installing blinds systems. 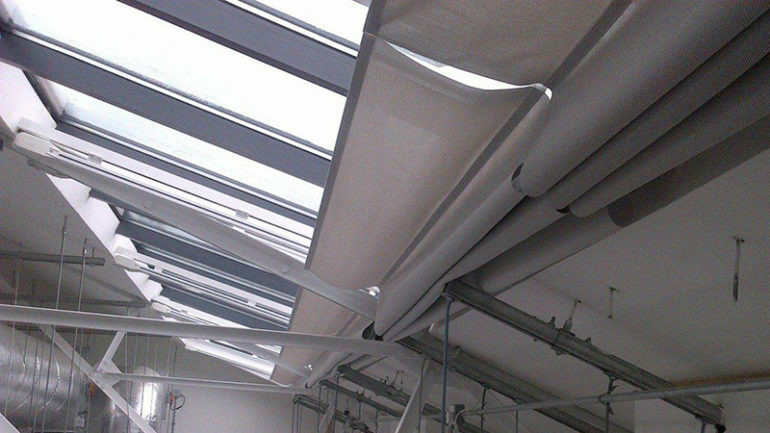 If your building has an unusual shape or difficult to access windows, our team will take measurements and devise the perfect motorised blinds systems for your space. Since we make our designs in house, they can be customised to any shape and style required. Additionally, your blinds can be customised with your choice of fabrics and colours to get the exact look and feel required. Our motorised control blinds systems come with handy remote control operation. The batteries in these remote controls are fit to last for years and additional controllers can be provides for ease of use in larger spaces. In case of power failure, manual backup operation is also possible.